HOME - Buffalo-Dortmund Auslandsgesellschaft.de e.V. Shepherding high school students between the Sister Cities of Buffalo, NY and Dortmund Germany for past 40 years! – building lasting relationships and lifelong friendships. 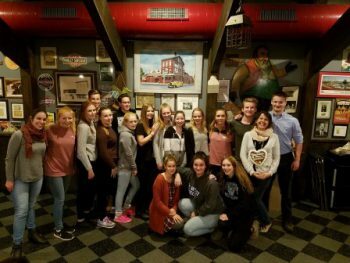 German high school students and the group coordinators at their farewell dinnerOn the following pages we’d like to convince you of the hosting experience- Maybe you have considered hosting a German student but you weren’t sure if you’re really up to it. On this homepage you can get to know the programs. You’ll see exactly what you sign up for if you decide to become a host family. Furthermore, statements by former host families might ease any doubt you still have about taking in a German student… You might even become a supporter of our exchanges and end up writing your own enthusiastic statement! If you are not interested in hosting but rather in participating in an exchange program in Germany, this is your site as well! Both High School and University students can find information about participating in an exchange program. Depending on your age and school enrollment, there are two programs worthy of consideration. 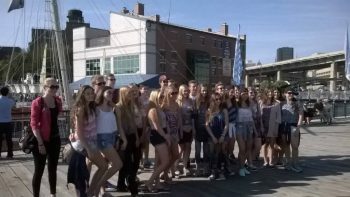 For high school students the summer exchange (age 14 – 18) is a possible three-week stay in Dortmund, which includes visits to other German and Dutch cities. For college students, the college exchange is an opportunity for a stay in Germany, where they can acquire German language skills among native speakers. In order to follow recent events visit our facebook page!